For the past three months, my nails have grown incredibly long and so far (touch wood) they feel really strong and sturdy. My nails never last this long and they always break at the worst time so for them to last this long is extremely rare! But I think I've finally cracked my nail routine and found the perfect products to help you crack it too! I've tried to avoid filing my nails too much recently. I find that I over-file them and make them very thin and fragile which is often why they break. I'll only really file them if they're beginning to chip or get too sharp but otherwise I'll leave them be. But when I do file them I use the O.P.I. 240 Edge file which I've used for years (not the same one of course). Then I follow up with the O.P.I. 180 Flex file which is my go-to buffer file! You simply buff this over the surface of your nails to remove any pesky ridges! I love this as it makes my nails look so healthy and professional once they're painted! I never know the deal with cuticles. Cut them? Push them? Who knows what the right way is! I tend to push mine down slightly so they're all rounded at the bottom. But I don't push them too far as I hear they're there to protect your nail beds from getting infected. I then go in with The Body Shop Olive Beautifying Oil and massage this into my nail beds. As soon as I've massaged it in, I tend to wipe away the access and let it sink in for a little longer before I go and wash it off my hands. Now, I'm not sure how similar this is to actual Olive oil - I'm sure that would work just as well. But this is what I have in my collection. For me, applying an undercoat is a crucial step. I find it protects my nails from any discolouration and just adds as a good base for my nail polish. The Sally Hansen ones are always a good shout! I tend to use ones with a growing formula in it but I recently picked up the Hard as Nails with Nylon undercoat and this works really well. I think this is what has given my nails so much strength. I also love that it dries so quickly! Talking of drying quickly, my final must-have product in my nail care routine is a good top coat. I always find top coats take forever to dry but I have finally found one that works so well! It's the Revlon Quick Dry Top Coat. This top coat truly is a quick drying formula but also leaves your nails with a nice glossy, professional finish which is just what I need! 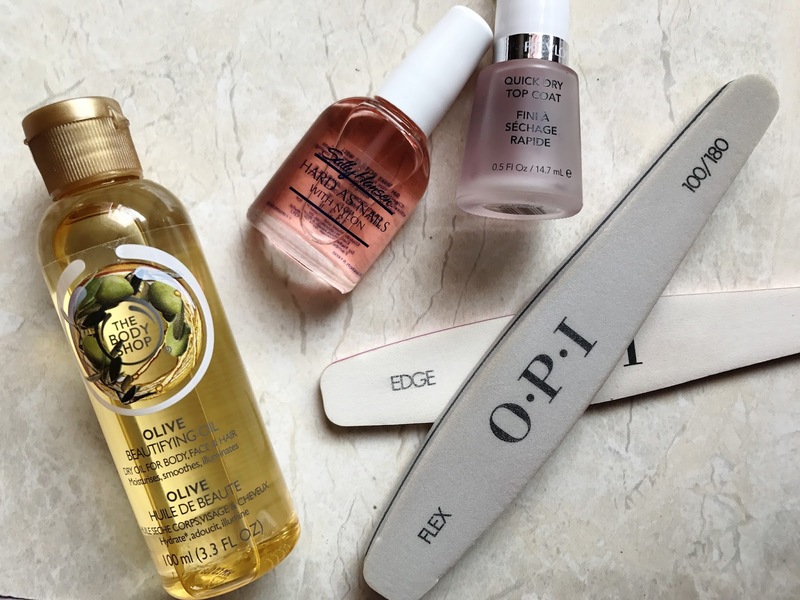 What are your essential nail care products? I'd love to know!